I'm sure by now you've noticed the delightful addition to Facebook in honor of Harry Potter. If you haven't, I'll quickly sum it up: type "Harry Potter," "Gryffindor,"'Ravenclaw," "Hufflepuff," or "Slytherin" into a status update and click on the word for a lovely little surprise. 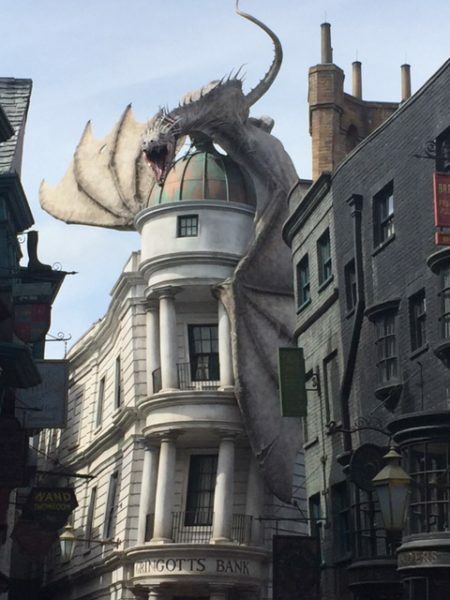 It's just one of the online celebrations of the 20th anniversary of the Harry Potter universe. For us Potterheads, this is a big event, a time wherein we can look back on how the books and resulting movies have touched us for the last two decades. We fans of the series each have our own stories of how the Potterverse came into our lives, some through our kids, others, like my own, through word of mouth that there were these books that were written for kids but were so good, so magical, that they were required reading. I learned of the series when the Twilight series was hot, and since I found those books lacking at best, I was eager to find a series that really grabbed hold and didn't let go. And of course I found that in the Potter universe. Never before had such an intricate world of fantasy grabbed hold of me. I had not read the Lord of the Rings series, or any other fantasy universe, so going full tilt into the land of Hogwarts was a thrilling ride for me. But beyond the books and movies, there were the fans. And in my opinion, it is the fan base that makes Harry Potter more than another group of books. Potterheads are their own kind of magic, and being part of that fanbase has become something that I hold very close to my heart. One only has to look at the current Facebook trick to see how widespread the fanbase is, with people of all kinds are proudly professing which Hogwarts house they are part of. From the cunning Slytherins to the kindly Hufflepuffs, everyone who is taking part in the Facebook celebration of the Potterverse not only has identified with which house they are part of, they are so proud of that identification that they are shouting it from the rooftops, finding others in the same house, and discussing at length their sub-categories (for example, I am a Hufflepuff with Gryffindor traits, less so Ravenclaw, and only the tiniest bit of Slytherin) and how their real lives mirror what houses they are part of. This crossover from the Potterverse into the "real world" allows fans to learn more about themselves, and each other. That's a beautiful thing. So happy anniversary, Harry Potter, Hermione Granger, Ron Weasley, and all the rest. Thanks to you and your wonderful creator, the great Jo "JK" Rowling, people from all around the world, children and adults alike, have found a world where we are celebrated for both what makes us similar and what makes us different.